The Giant Marine Toad is also known as the Giant Toad or Cane Toad. Their body length is 4 to 9.5 inches, and they can weigh up to 3 pounds. They are brown to yellow brown with prominent cranial crests. Paratoids extend down the sides of the body. The body outline is somewhat round and flattened. Females are larger than males. 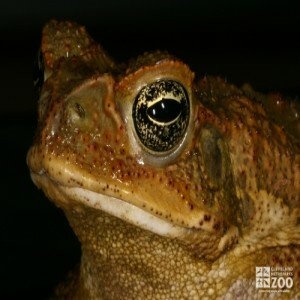 Giant marine toads range in Central and South America and were introduced in Australia. Giant marine toads habitat includes almost any humid site with adequate hiding places. Giant marine toads are primarily nocturnal. Although most toads are solitary, if insects are plentiful, one may find a gathering around a pond or pool, sitting in the glare of a street light and picking off numbers of insects. During the day they can be found beneath fallen trees, leaves, rocks or vegetation. The secretion of the paratoids is highly toxic. It will burn the eyes and may inflame the skin. Dogs or cats that bite this toad will sicken and may die. Giant marine toads will breed year round if temperature and rainfall are adequate. The eggs are laid in long strings (one from each ovary) in long standing water such as ditches, canals, streams, ponds and fish ponds. Eggs and tadpoles are poisonous and displace native tadpoles. Larvae are tolerant of high temperatures. Insects, small mammals, some vegetation, carrion and even dog food. Crickets, mice, depending on size of animal.